UPDATE: The motion to proceed on the Penny Plan Budget failed. Sen. Paul shared the roll call vote on his Twitter page. On Thursday the Senate will vote to balance the budget - or not. Sen. Rand Paul (R-KY) predicted on Neil Cavuto's Fox News show Wednesday that half of his Republican colleagues will show their true cowardly colors and vote against his Penny Plan Budget, which would cut about $30 billion in spending. "When we have this vote tomorrow, half the Republicans in the Senate will show their true stripes, and they won't vote to balance the budget, even though they say they`re for it," Paul said. "When they're home at the local rotary, they say they're for it. So, really, you can`t give people courage. You can't give people intestinal fortitude." He also put his frustrations on paper. "Once upon a time, there were fiscally conservative Republicans," Paul wrote in an op-ed for The Hill. "Hypocrisy is the only explanation" for Republicans voting for both a Balanced Budget Amendment and a massive spending bill in the past few months, he charges. However, he is offering them a lifeline. His Penny Plan Budget will hopefully be a "redemptive vote" that will restore budget caps. The legislation will require a 1 percent cut in federal spending in each year for five years. Much of those cuts, he said, can come from defense education, and corporate welfare. 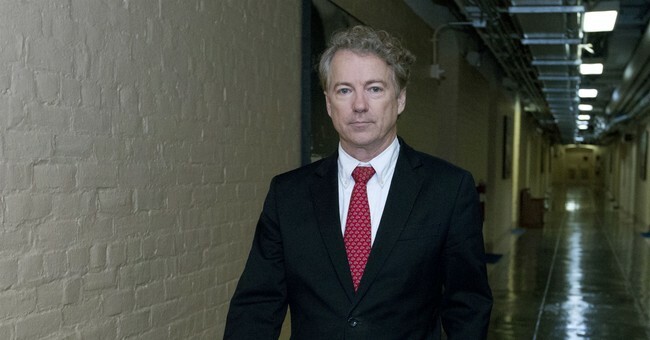 Republicans may grow a spine and actually pass his plan, Paul said, but he's "not holding his breath."